The New Yorker's annual tech issue just came out - see my previous post for the awesome cover - and as usual it contained a lot of interesting stuff. 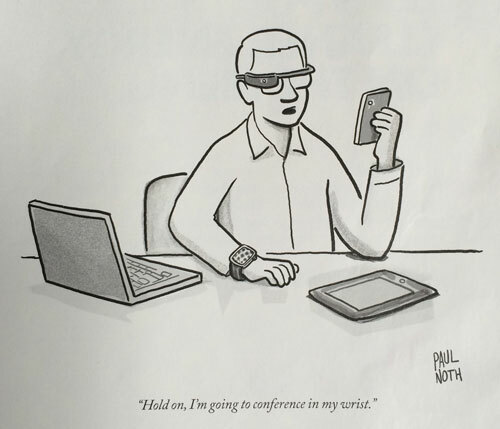 I can't do it all justice, but I can summarize one clear trend: there are more and more articles about "wearable computing". Wrist devices, glass devices, various types and styles of fitness trackers; these are all examples of wearable computing. But they are only the start. Each of them generally functions by communicating with your phone, leveraging its superior compute power, battery life, and cellular connectivity. In the near future though we're going to see these devices integrated into clothes to a degree only hinted at now. Why not put a phone in a shoe? (Paging Maxwell Smart!) Plenty of room for batteries. Or in a belt. Some belts weight more than some laptops. Your shirt can surely measure your heartbeat and other body functions better than any strapped on device. And so on. And only one step after that will be implantible computers, devices which become a part of your body, both to measure it and to communicate with it. In my lifetime I confidently expect to see all of us carrying around various implanted computers. It will change our lives. (And can you imagine the sports controversies!) Augmented reality, indeed!